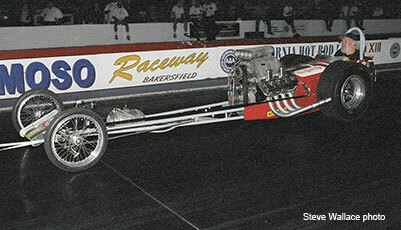 The Chassis was original built for Ed Schutz from Lompoc Cal by Tommy Ivo. It was the first car Ivo built to sell. 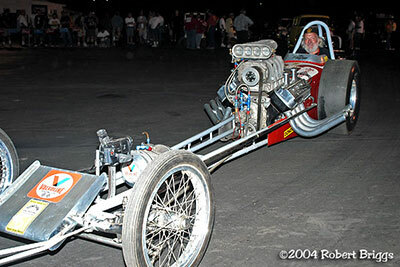 Rod Pepmuller did the welding, and Rod told King he learned how to weld on this car. 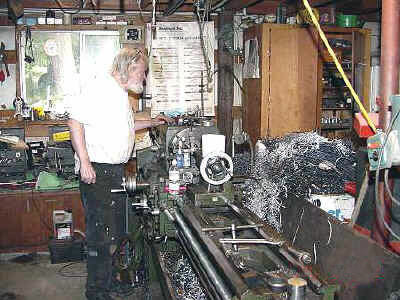 The front end is a Kent Fuller. 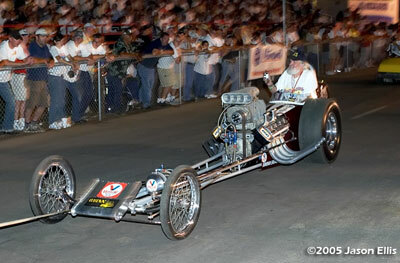 It originally ran under under Ed's Muffler banner with Dave McKenzie driving. It had a Bob Sorrell Body with an Easter egg paint job. 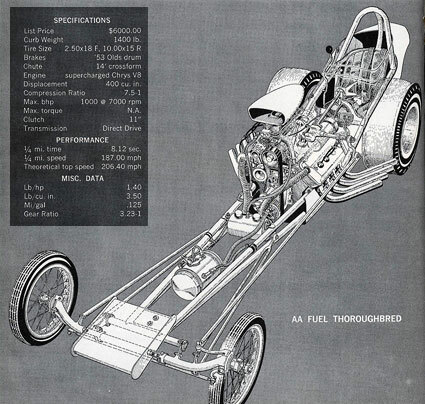 It was featured in the first Drag Racing Magazine with a cut-away drawing by Pete Millar. 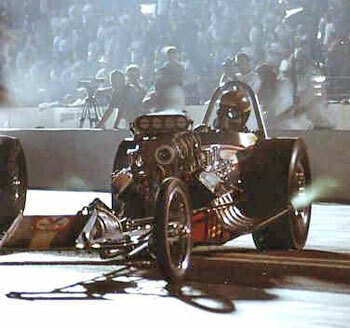 Under its original team, the car had won the #2 spot on the 1320 List. When Purchased by Charlie Doss and Del Clayton the #2 spot went with it. It was purchased less motor in early 1963. 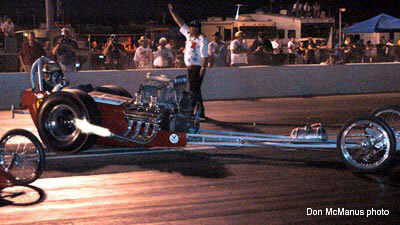 McKenzie had destroyed the last 392 that Ed Schutz had at Pomona a few weeks earlier. 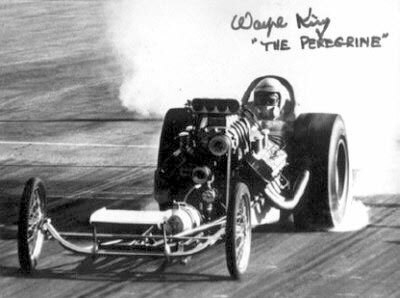 Wayne King, the new driver, lost the #2 spot in 1963 to the little blue home made Chevy dragster of James Warren, Roger Coburn and Chuck Holloway. 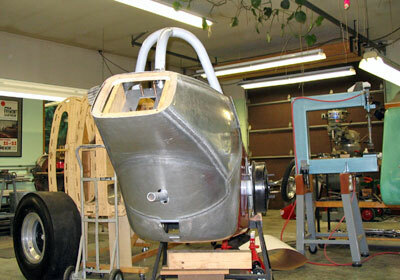 When the car was campaigned by Doss, Clayton & King it was powered by a 1956, 354Cu. In. 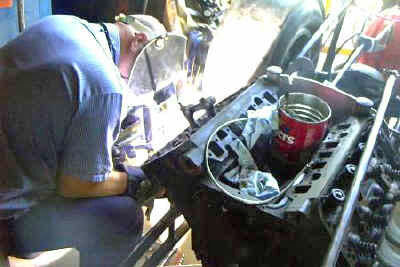 Chrysler engine. 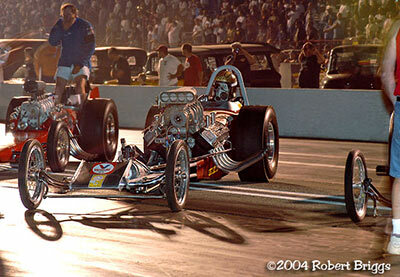 At one time it held most of the A Fuel records at Southern California and West coast strips. 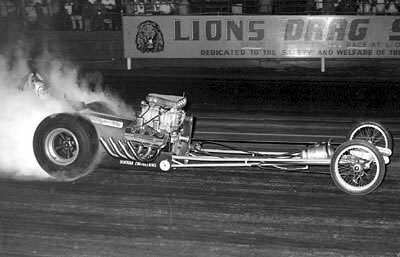 After a large wheel stand at Lions in late 1963 they had the Ol' Man, Frank Huszar at RCS lengthen it to the present 140" wheel base. It was retired after the 1964 season. Upon its retirement in 1964 the car was sold to a party in Northern California. 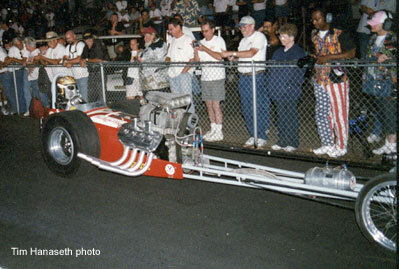 While traveling to his engine machine shop one day, Gerry Steiner saw the front wheels and axle of a dragster in a garage he had passed. Gerry turned around to take another look see. He couldn't see the rest of the car because it was under a pile of boxes. Gerry went up to the front door and asked about the car. The car had been in this garage since 1968. 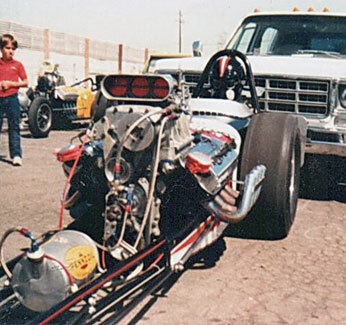 It was parked after the owner didn't qualify for a Top Gas race at Fremont till this day in 1984. 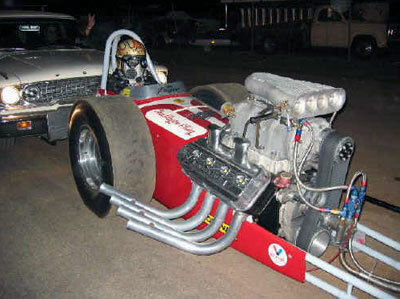 The car was a complete car with a blown 392, Scott injectors and Gold striped M & H slicks. Gerry brought it for $2500.00. 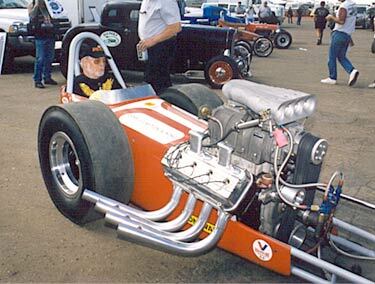 The motor had M/T aluminum rods, stock stroke crank, .030 over Jahns pistons, Donovan gear drive, Cirillo Magneto, A-1 block with 4 bolt mains and 2'' blower drive. 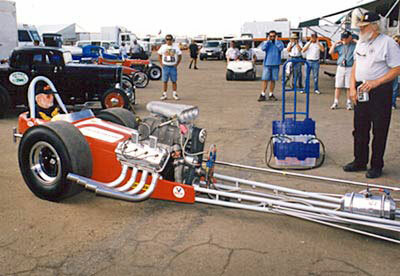 In two weeks Gerry, Brad Berger and Roger Lee rebuilt this Ivo chassis-ed dragster into an alcohol burning Nostalgia Dargster for the Hot Rod Drags at Fremont. 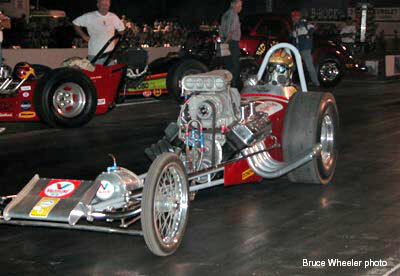 It ran 7.98 at 192.78 mph. 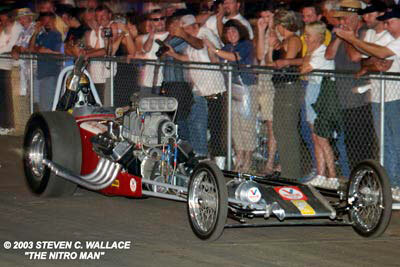 In 1986 the car was sold by Steiner and ended up back with its orginal driver and current owner, Wayne King. 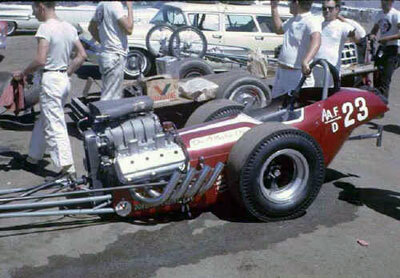 It then went into into Wayne King's garage where it remained until Steve Gibbs put together a one time get together at Bakersfield. 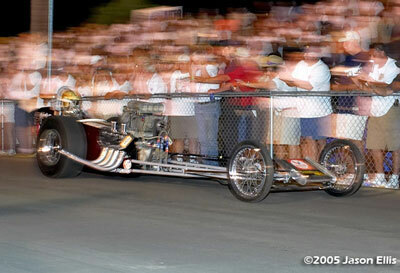 Yep, this car was at the very first California Hot Rod Reunion in 1992. Since then it has attended all but 3 of the 15 CHRR's. 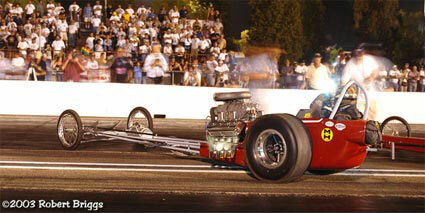 But then King make it live and debuted the Doss-Clayton-King car in running form at the 2002 CHRR. All was well until during a fire-up in the pits Saturday a head gasket failed and the engine sustaining other damage in the process. This put King on the sidelines losing his chance to be in the Cacklefest that night. This was a great disappointment to all. The car was restored to its original 354 Chrysler configuration. 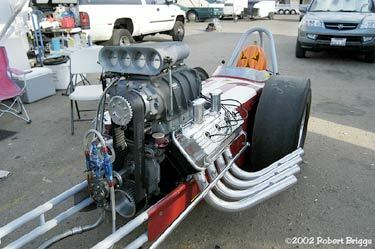 It has the original compression, a Howard camshaft (original grind), Van Charger blower, Isky blower drive, Welded Donovan can, 2 disc Scheifer clutch, Joe Hunt Magneto, Hilborn 4 hole Bug Catcher Injectors. The length, tin work, and paint job are per original. 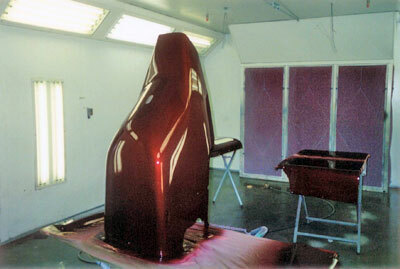 The body restoration was done by Jim Hume in Sedro Wooly Washington. Paint by Kingston Collision of Kingston, Washington. Lettering with a real paint brush and paint by Bob Thompson of Team Thompson. King's long time friend from Bakersfield Gary Guinn of Guinn Construction stepped up and made it possible for the restoration to be almost completed. Out of the rafters, the old girl underwent the necessary repairs to live again. 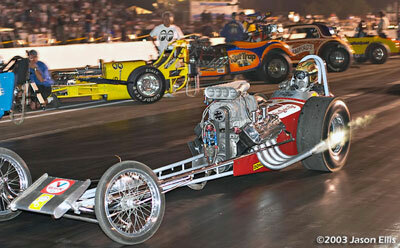 Rounding up the proper parts was no easy task but with his expansive resourses and old friends things came together. 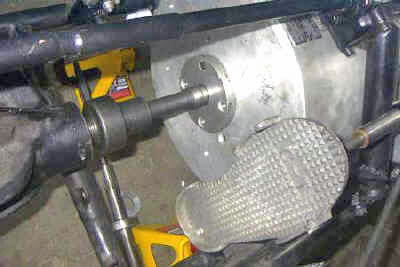 The Greek coupler connects the engine to the 49' Olds rear. 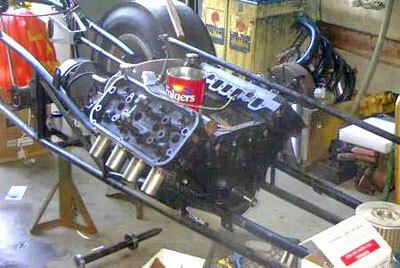 The rare hydraulic throttle linkage came from collector, Tom Wilford along with the C-T Automotive gas pedal. King did much of the maching himself. 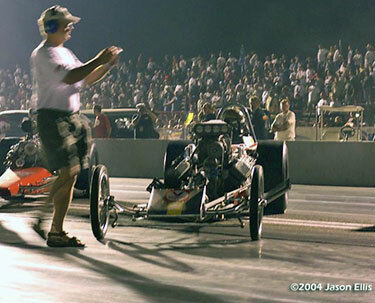 For a static cackle on Friday of the 2002 CHRR King (far right) put veteran drag racer and journalist Don "The Wavemaker" Prieto in the seat. 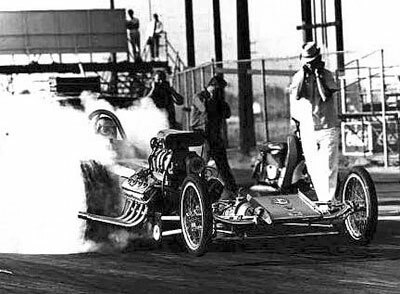 In the pits on Sunday King put a driver in the car that couldn't possibly hurt anything. 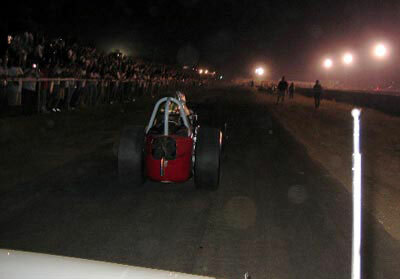 Wayne King in the Cacklefest V Parade. 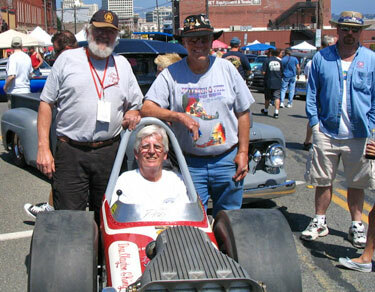 Push start from the top end a Cacklefest V.
Three old Northwest racers pose in Tacoma, WA - Wayne King and Herm Petersen standing with fellow cacklecar owner Pete Starrett in the seat. 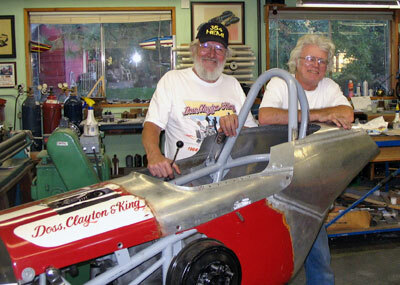 In 2005 Wayne King (left) had tinman-design wizard Jim Hume (right) put the finishing touch on the car - the tail piece. Kingston Collision in Kingston, WA did the paint. Bob Thompson finishes the update with hand lettering. 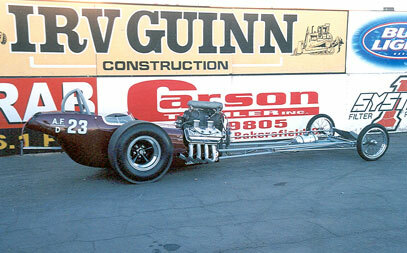 CHRR 2005 - the car poses under the main sponsors sign... Irv Guinn. 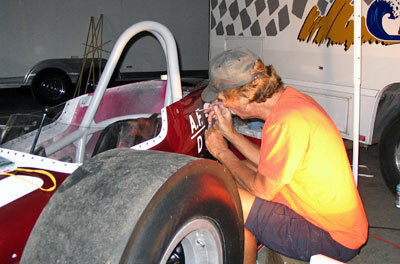 After adding the final touch to the D-C-K car, the tail piece, King was back in 2005 for his third Cacklefest.